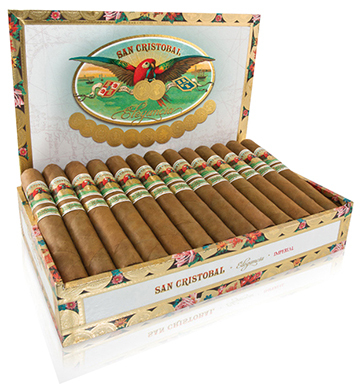 The San Cristobal Elegancia is a medium-bodied cigar that is handmade in Nicaragua by the renowned Garcia family. Featuring a golden blond Connecticut-seed wrapper grown in Ecuador and an artful assemblage of the finest aged Nicaraguan tobaccos, this delightful cigar sets itself apart from other Garcia-made gems because the typical peppery-spice takes a backseat to a smooth, creamy, and earthy mélange that will reward your palate. We have no doubt the San Cristobal Elegancia cigar will become a mainstay in your humidor if it isn't already.